Eldon Billips was born May 8, 1930 to Oren and Opal (Stone) Billips on the family farm in Graham County, Kansas. 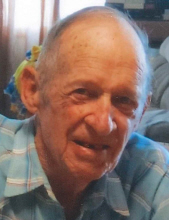 He died peacefully surrounded by loved ones at home on the family farm on July 2, 2018. He was 88 years old. Eldon went to Spring Creek School for his first eight years of his education. He graduated from Hill City High School in 1948. He enjoyed hunting, fishing, playing cards, pool and gardening. He was a farmer and stockman most of his life. Eldon married Leora (Cutting) November 2, 1952. They had four children: Judy, Janet, Larry and Gary. They divorced after 17 years. Eldon married Bettie (Wharton) February 23, 1983. Eldon is survived by his wife Bettie of the home; sons: Larry (Rita) of Oakley, Kansas, Gary (Deb) of Grand Island, Nebraska; daughters: Judy (Richard) Durham of Palisade, Nebraska, Janet (Raphael) Schmidtberger of Ellis, Kansas; step-sons: Jeff (Kim) Carter of Moore, Oklahoma, Russell (Lavonda) Carter of Lincoln, Nebraska; step-daughters: Melinda (Mike) Nickelson of Moore, Oklahoma, Teresa (Eric) Stinemetz of Pensacola, Florida; eight grandchildren; nine step-grandchildren; 18 great-grand children and 13 step great grandchildren; one brother Don (Mary) Billips of Hill City; numerous nieces, nephews and friends. He was preceded in death by his parents; sister Melvia Howard; brother-in-law Ivan Munson and his ex-wife Leora Adams. Eldon was a member of the Hill City Christian Church. He loved animals and never met a stranger. He was an honest, hardworking man who was loved by his family and will be greatly missed.